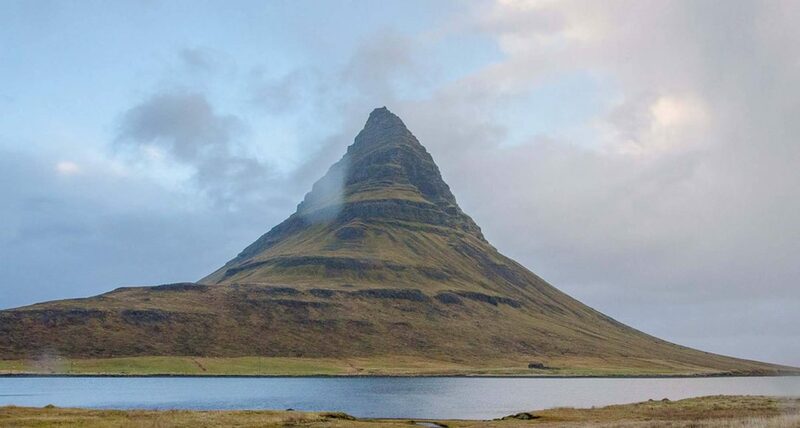 Iceland has always been on our bucket list. One rainy Sunday afternoon we watched The Secret Life of Walter Mitty. It didn’t take long for us to bite the bullet and booked flights that same afternoon. We only had a week available to see as much as possible. Everything we’d read suggested that we needed longer but we decided to attempt to road trip around the island anyway. Since October is the beginning of winter in Iceland many smaller inland roads are closed, even to four wheel drives (which we rented). Hence, we decided to drive around Route 1 (the Ring Road) in a clock-wise direction, with some diversions onto secondary roads along the way. As can be seen from the route map below, our stops included: Reykjavik; Stykkisholmu; Ólafsfjordur; Húsavik; Hofn; Hella and Keflavik. There were some long days driving, due to our mis-calculations. We were also slowed down a couple of times by bad weather. Despite a few sacrifices having to be made we made it all the way around the island successfully. Read more about our road trips in Southern Germany and the Rioja region in Spain. We decided in advance where we were going to stop each night which had advantages and disadvantages. The main advantage being that some towns had very few hotels and restaurants open so by pre-booking it meant we weren’t driving around for hours looking for a place to stay. The main disadvantage was that on the couple of days we had really bad weather we may have stopped earlier if we hadn’t already booked a hotel. It did force us to stick to our original driving plan. 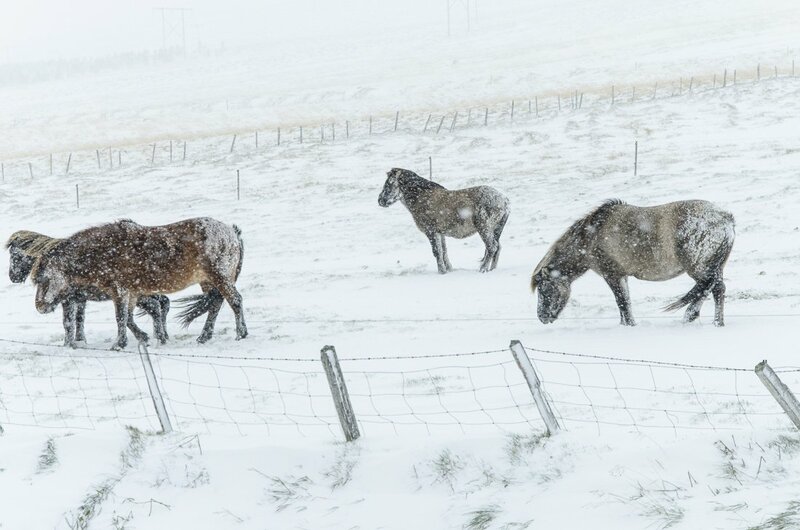 Apparently it is crucial to book ahead if you go to Iceland in summer. Iceland is expensive, even in low season, you don’t get the same value for money as in mainland Europe, but it was worth every cent we paid! It is a country that has the “WOW factor” around every corner. The landscape is ever changing and incredibly diverse, a photographers dream :). 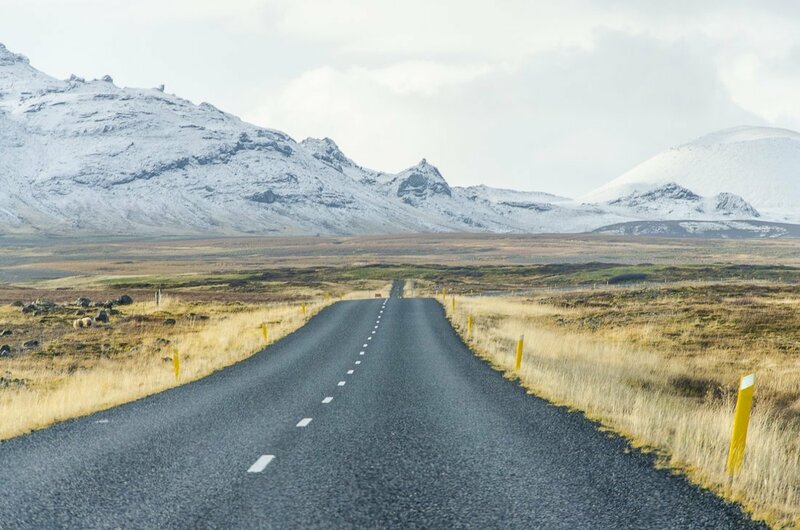 So much of visiting Iceland is about the journey from one destination to the next, hence we would highly recommend driving around the island. 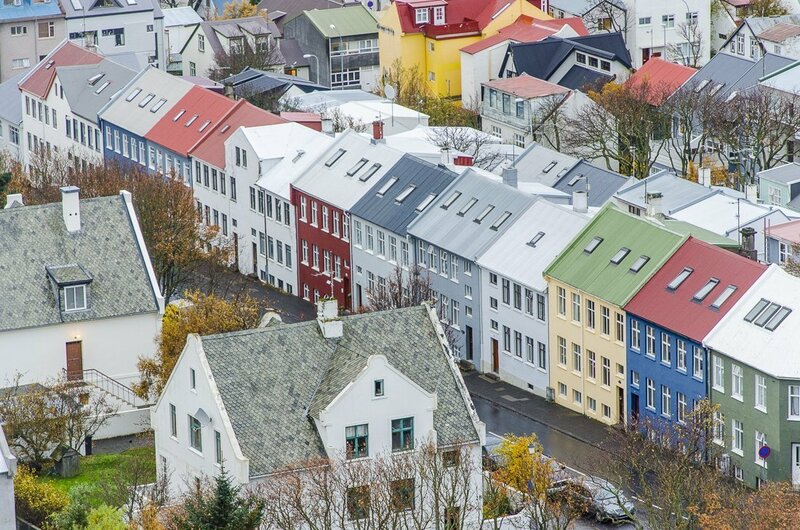 We flew into the capital, Reykjavik and stayed our first night in this up and coming city. 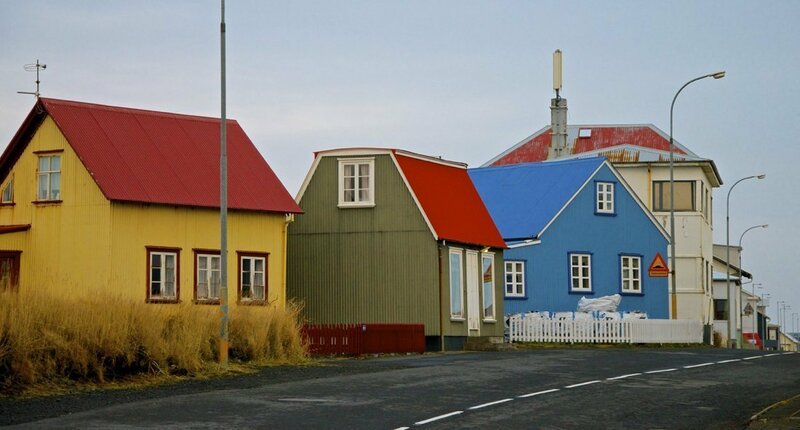 It’s an easy city to walk around with cute colourful buildings lining the streets and a small centre. We were there on a Sunday and most of the shops were closed. After leaving Reykjavik we headed to the Snæfellsnes area. 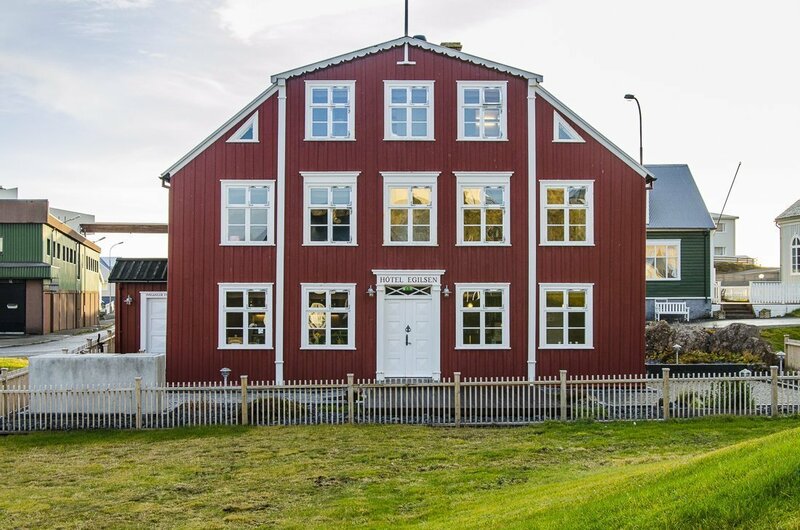 We arrived in Stykkisholmu in the early evening. By the time we got settled in our hotel the little light there was had disappeared. When we woke up the next morning we were pleasantly surprised by the amazing scenery and beautiful light. It also happens to be one of the scenes in The Secret Life of Walter Mitty which we didn’t realise when we booked the hotel. 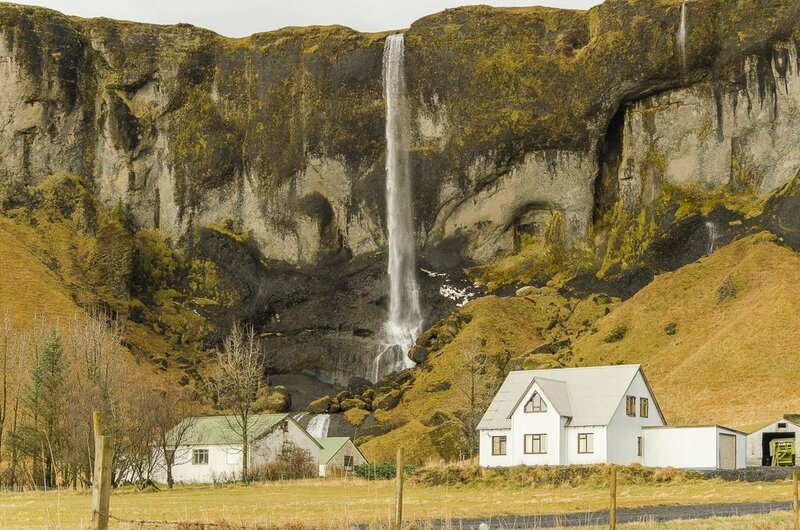 Iceland is dotted with waterfalls big and small. The first major waterfall we encountered was Godafoss (Waterfall of the Gods) did not disappoint. Even on a glum overcast day where the temperature must have been close to zero, Godafoss projected a sense of majestic rawness. There was something wild and woolly about the waterfall that made us want to photograph it from every angle. 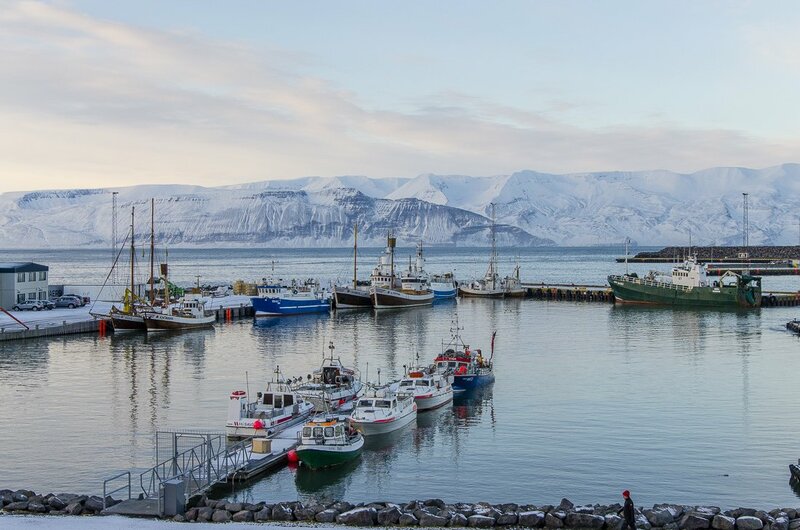 Húsavík was more of a place to stop for the night for us. 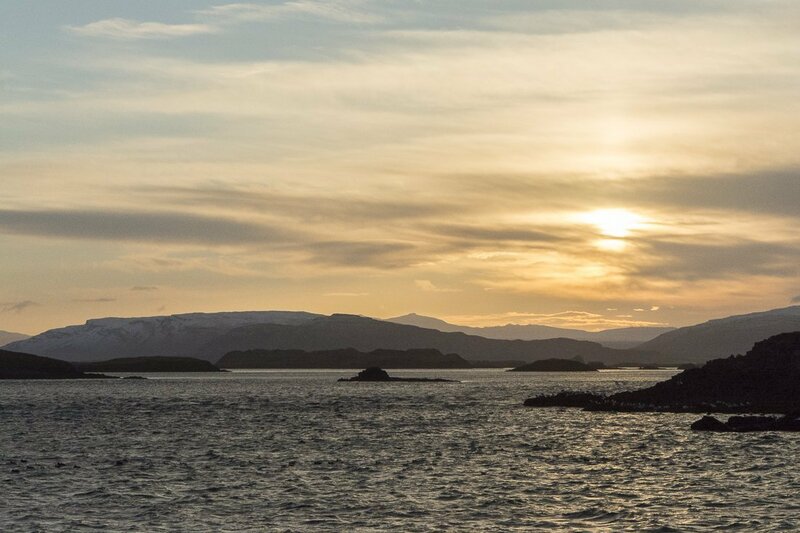 However, it is a great place to go whale watching, particularly from May to September. We allowed ourselves a short stroll around the cute little fishing town the following morning. 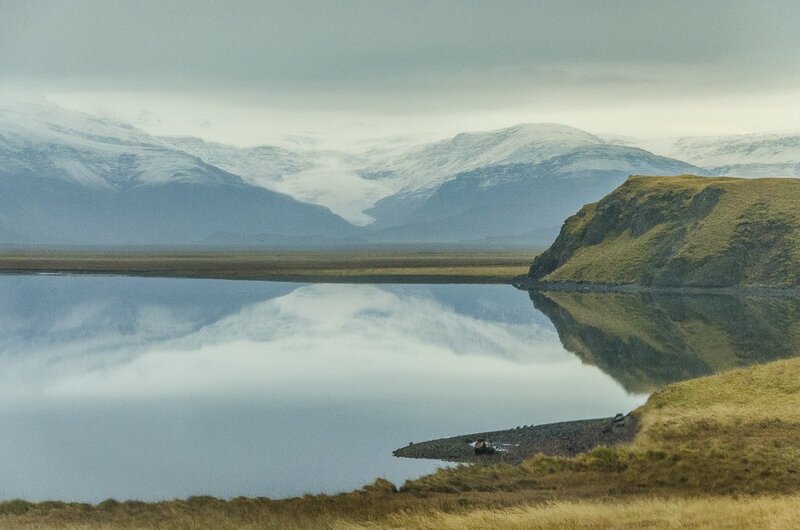 The Myvatn area is in the north of Iceland and is not to be missed. The landscape is like another world, it represented an out of this world moonscape. 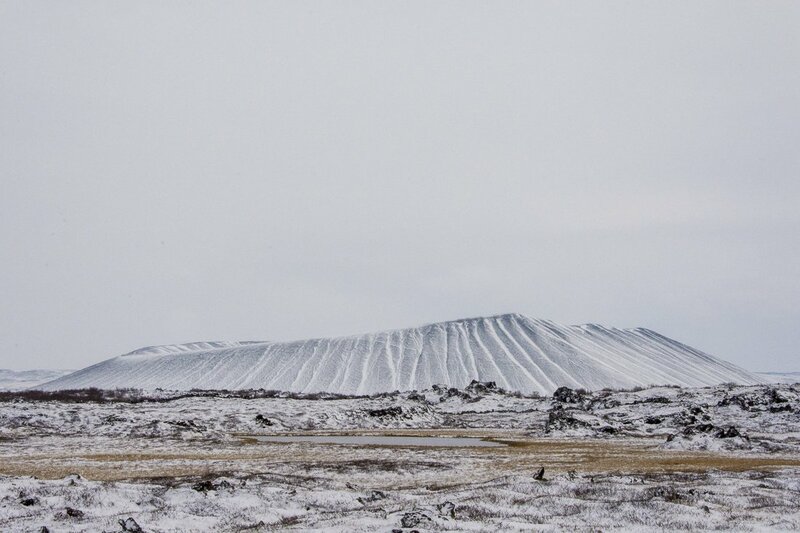 By the time we had reached the north the weather had worsened and Myvatn was covered in snow. 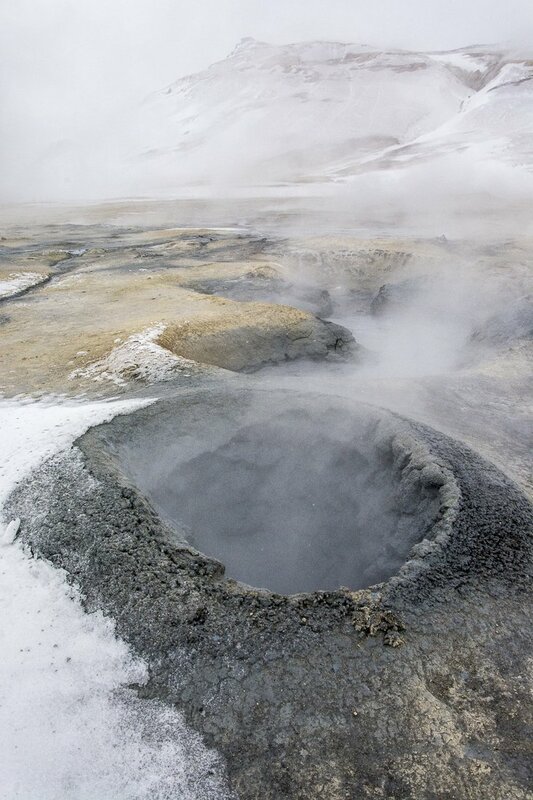 The region consists of volcanic craters, spluttering mud pots and steaming vents and fumaroles. We would highly recommend the Myvatn Nature Baths. Although they are smaller than the much more well-known Blue Lagoon near Reykjavik, they were not as touristy and equally relaxing and maybe even a tad warmer. 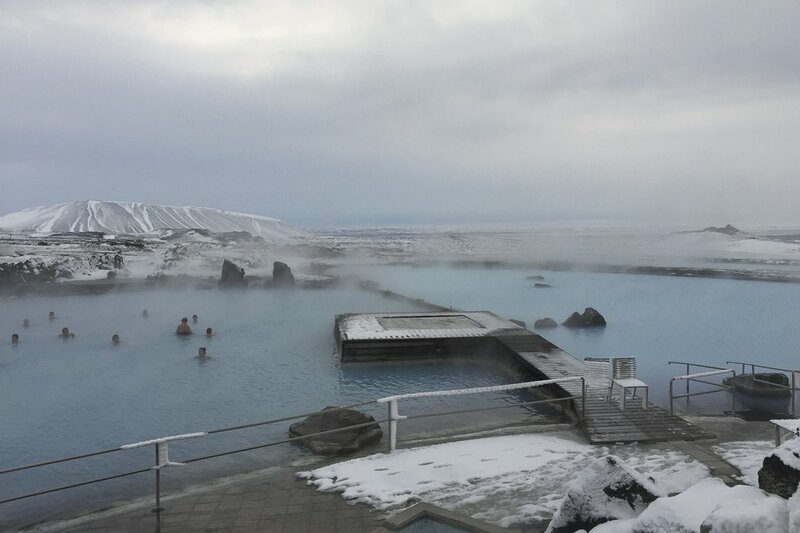 There was something incredibly surreal about being in a steaming, naturally heated, baby blue coloured pool while surrounded by snow-covered lava fields. It truly felt like something out of a science-fiction movie. 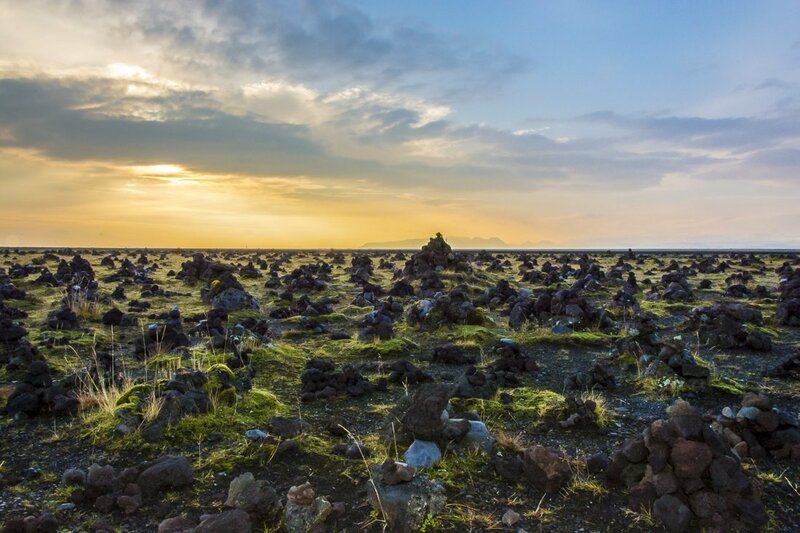 Not far form the baths is Dimmuborgir (the Dark Castles) a giant jagged lava field where stacks of lava tower above you. There are marked walking trails but unfortunately time did not permit us to explore this area. 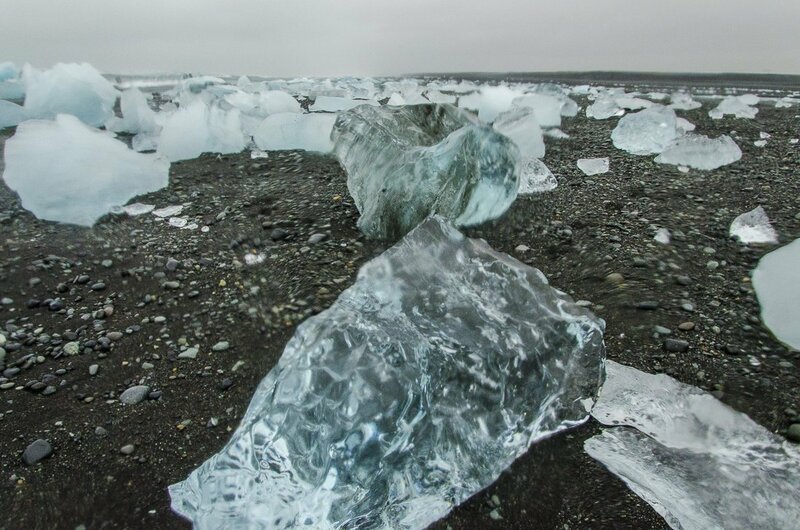 Jökulsàrlón is in the south-east of Iceland and is not to be missed. 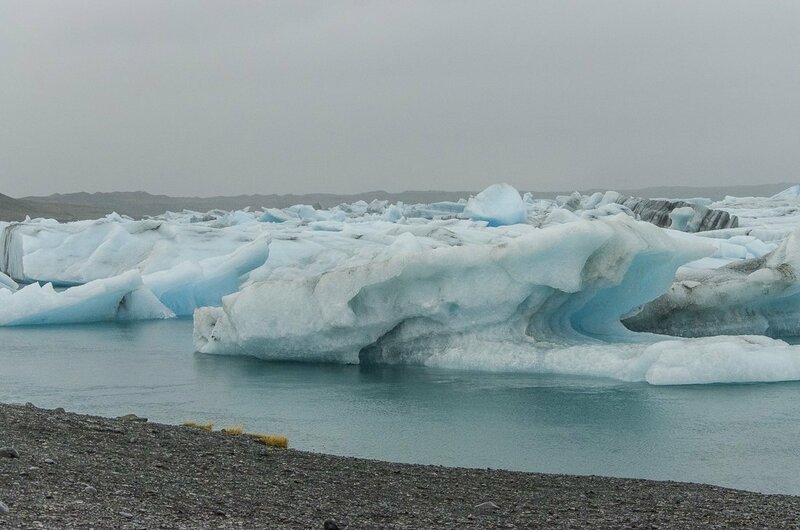 It is a lagoon containing icebergs that have fallen off the glaciers, of which there are many, in the area. 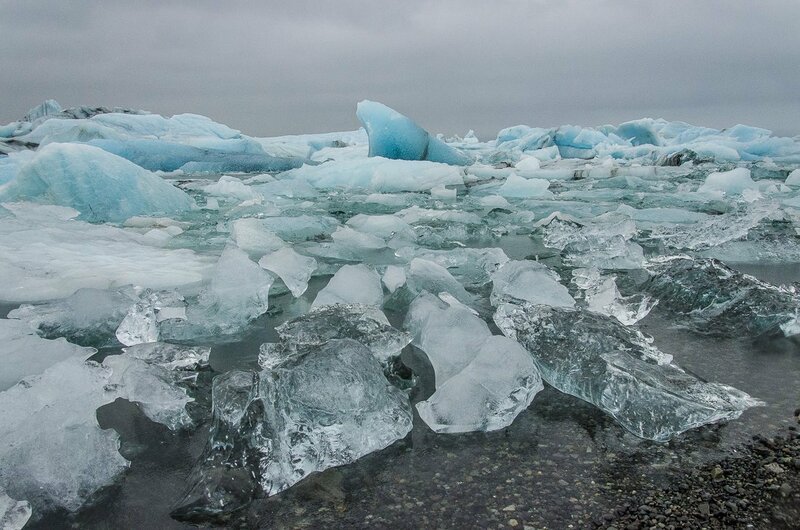 The bright blue colours of the icebergs were an incredible contrast against the dark, cold waters of the lagoon. 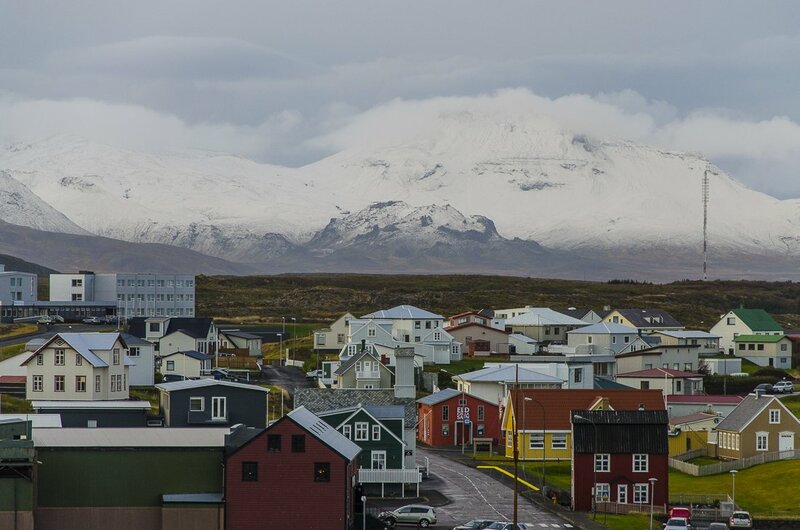 Once again, the weather was not ideal but is it ever in Iceland? The wind-chill factor made the temperature well below zero. There are boat trips around the lagoon but it was so cold on land we couldn’t bare the thought of how cold it would be on the water. The lagoon flows to the ocean which of course means the icebergs float into the ocean or become stranded on the black beach, which again was quite surreal to see. Heading along the southern coast we made an unplanned stop in Vik. As a town there is not much to write about but we did stop at a cute cafe, Halldorskaffi, for a late lunch. The friendly waitress told us about the local delicacy of Skyr, a thick, creamy, low in fat and sugar yoghurt. I learnt to love this quite early on in the trip and after moths of searching finally found it available in Munich. 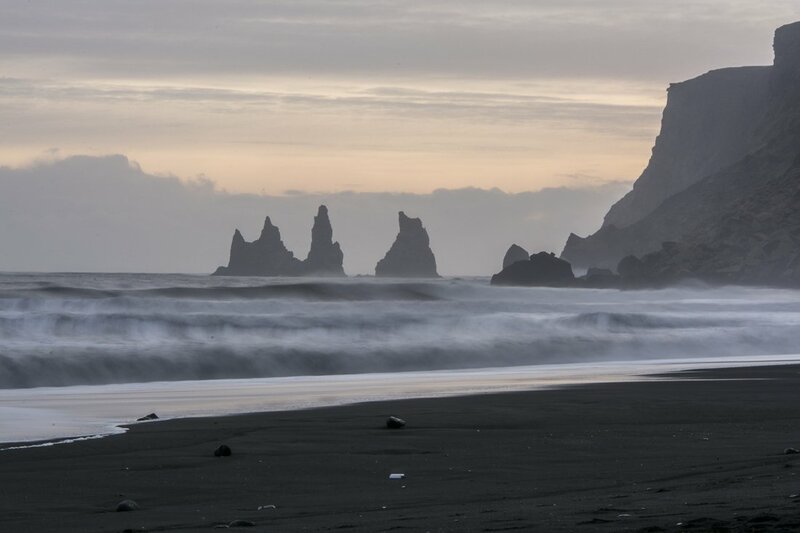 It turned out that just down the road from the cafe is Reynisdrangar, rock formations off the coast that look like fingers poking out of the ocean. It turned out to be a perfect photo opportunity, as attested by the photography class present. As the sun was setting and the sky was filled with beautiful hues of pink, orange and blue. 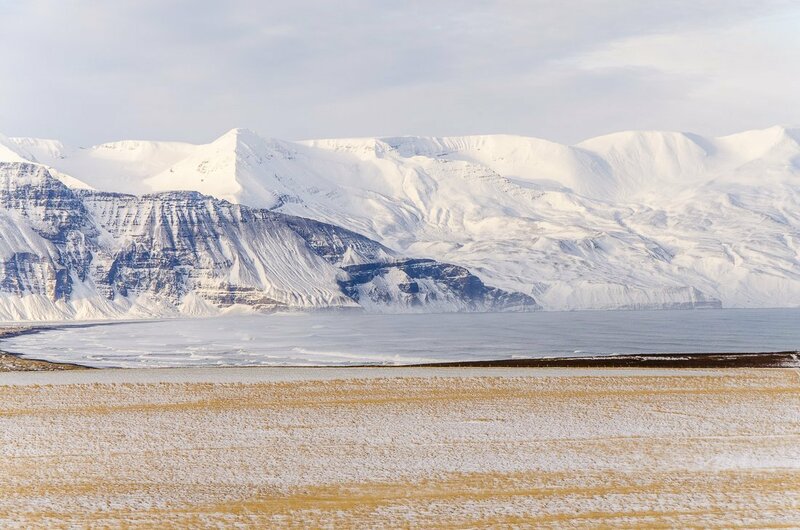 Driving in the south of Iceland is a slow process for a photographer. 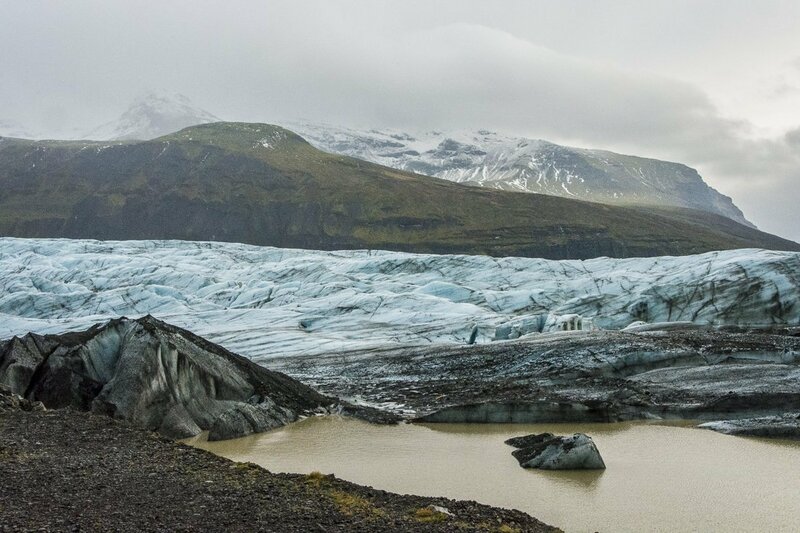 Not because the road is in bad condition but because there is everything from gigantic, intimidating volcanoes to moss covered lava fields to waterfalls in people’s backyards to glaciers that are like icy tongues almost licking the road. All in all, a magical experience. 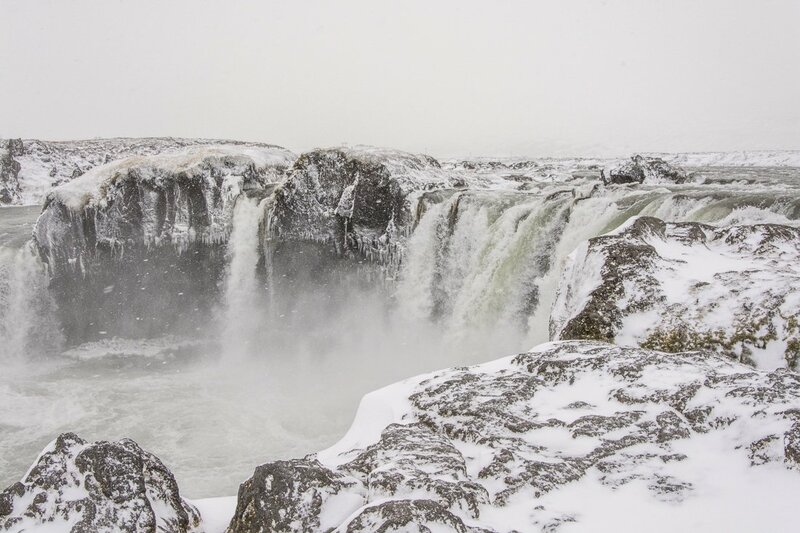 The Golden Circle is a day-trippers paradise, especially if you go early to avoid the bus loads of tourists. The three main stops are Gullfoss (golden waterfall), Geysir and Strokkur and Pingvellir National Park (which we didn’t have time to visit). 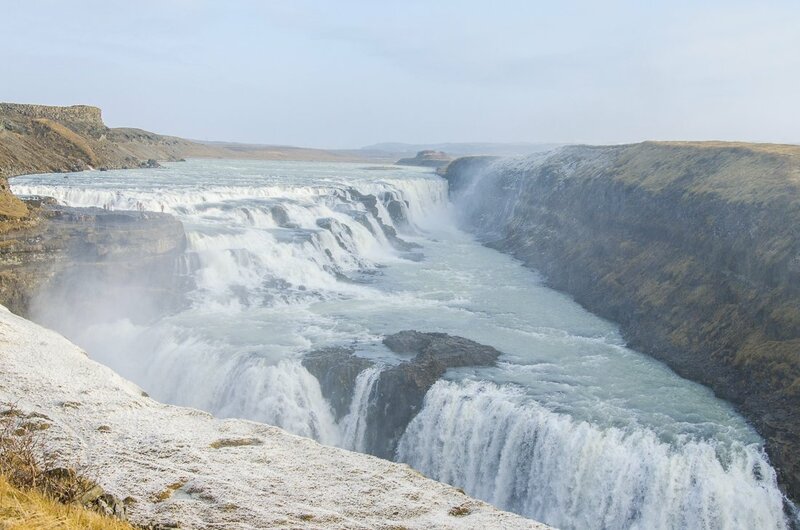 Gullfoss is a magnificient double waterfall that flows into a narrow ravine. We were lucky that the sun was shining and the sky was blue, showing off the area in all its glory. 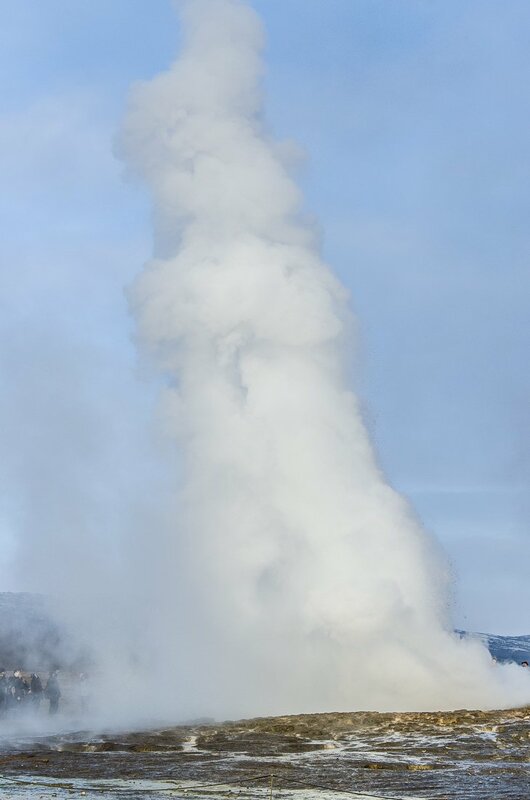 Geysir is the original hot water spout that all other geysers are named after. Unfortunately it became clogged and is not very active these days. 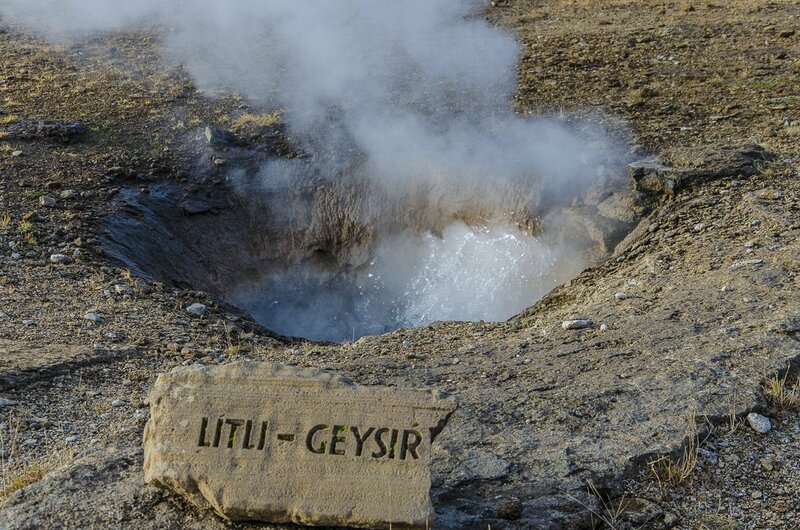 Luckily, right next door is the much more reliable Strokkur that erupts every 5 – 10 minutes. It was mesmerising waiting for this powerful spray of water to shoot into the air anywhere from 5m – 20m high above us. 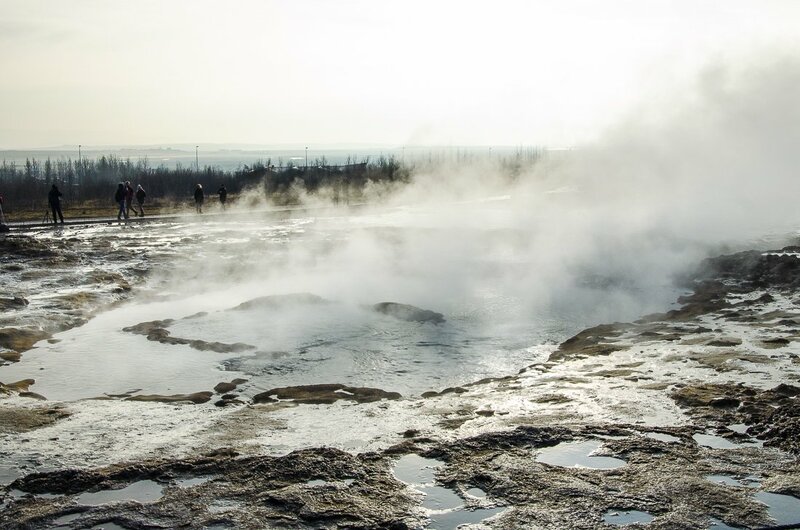 With all of the geothermal energy in Iceland it really made us realise what a powerful energy source it is. This tiny town on the south-west coast was pretty sleepy when we stopped there, albeit very cute with its colourful chocolate box houses. I imagine it is really lovely and apparently buzzing in summer. What we did enjoy was lunch at Raudahusid. We had had a few people mention the great seafood in the south, in particular the langoustine, and fortunately they did not disappoint at Raudahusid. The desserts were also pretty awesome :). 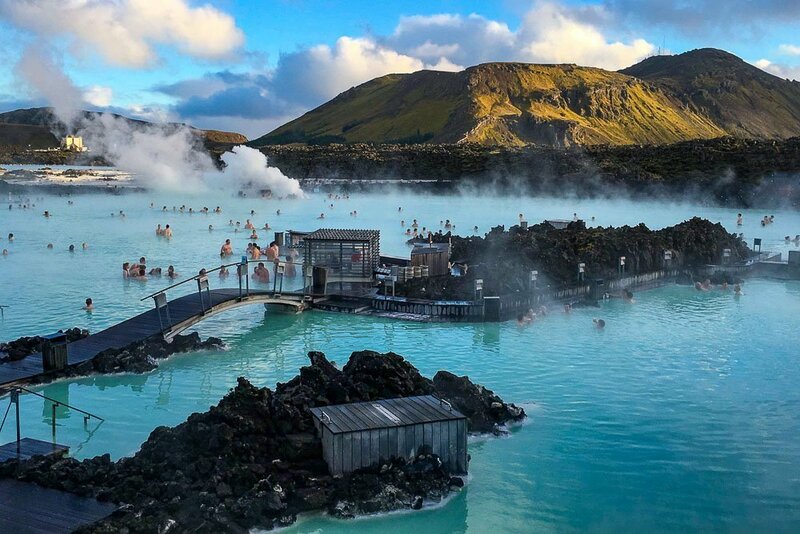 Most people who go to Iceland visit The Blue Lagoon, since it is a short drive from Reykjavik. Natural geothermal pools that it are very much set up for tourists in terms of facilities and prices. We prefer the Myvatn baths just because they were less touristy, however we still enjoyed The Blue Lagoon and did succumb to buying a couple of their products. Iceland blew our minds away day after day, kilometre after kilometre. The ever changing scenery that often seems out of this world is incredibly unique. 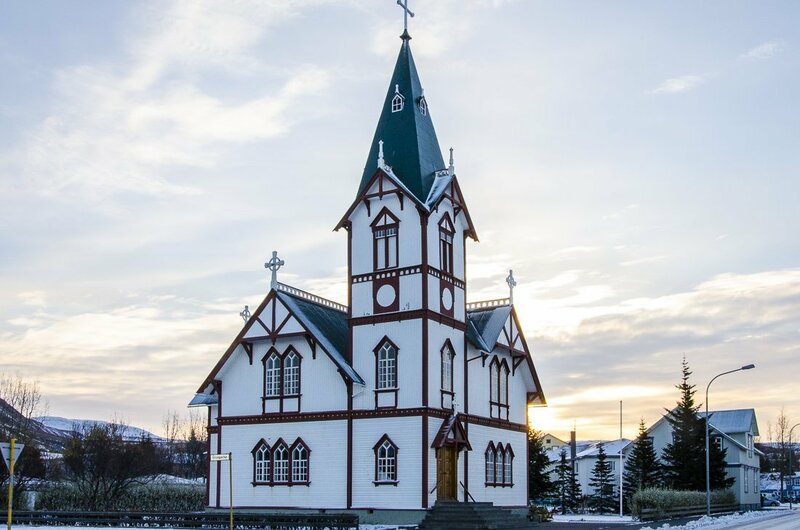 Iceland is becoming more and more popular with tourists so get there before it becomes too overcrowded, if it hasn’t already. 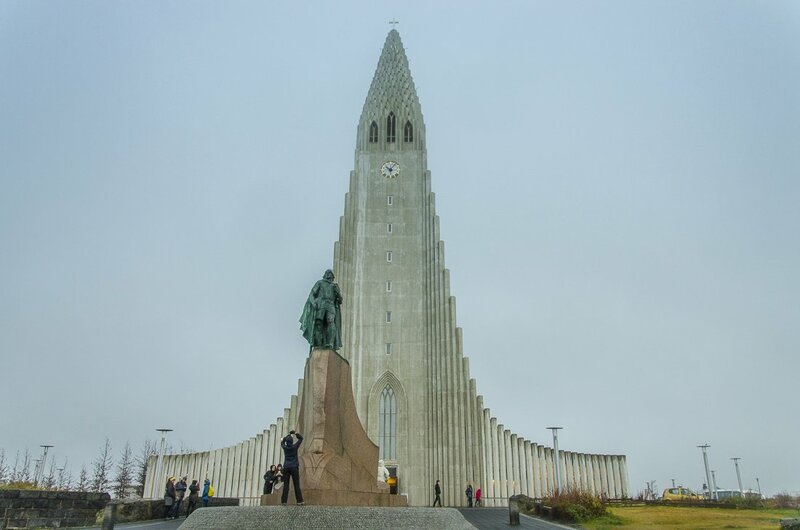 Have you been to Iceland? Which other places will you recommend?